Escobar Maduro Premium Cigars are a hand-crafted medium-bodied cigar with a perfectly smooth draw and a long lingering finish. They are a blend of three vintage sun-grown and aged Habano tobaccos grown specifically in the rich volcanic soil of Nicaragua. These blended and balanced flavors of the Escobar Cigar are dominated by chocolate and black pepper flavor, dried coffee and firewood that sticks strongly to the palate with delicious density, and possesses a persistent flavor of roasted nuts and wood smoke. These Flavors are blended to provide the complexity of the Escobar Cigar, thanks to the fermentation and aging process that only Puros Privados offers from generations of skilled Cuban cigar makers. The Club Escobar Frequent Buyer Membership Rewards Program is one way in which Escobar Cigars by Puros Privados strives to reward and thank loyal customers for patronizing our stores and purchasing our multitude of various premium handmade cigars and tobacco related products. Members of Club Escobar Rewards are able to earn and accumulate “Points” that can be redeemed for program benefits, also known as “Club Escobar Frequent Buyer Membership Reward,” at www.escobarcigars.com. 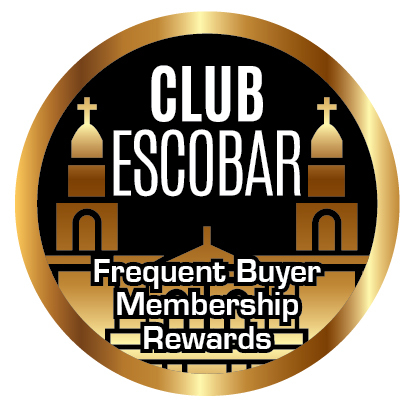 The Club Escobar Frequent Buyer Membership Rewards Program currently offers One Point for each Dollar spent for our Bronze Tier while additional points can be earned at higher spending tiers.